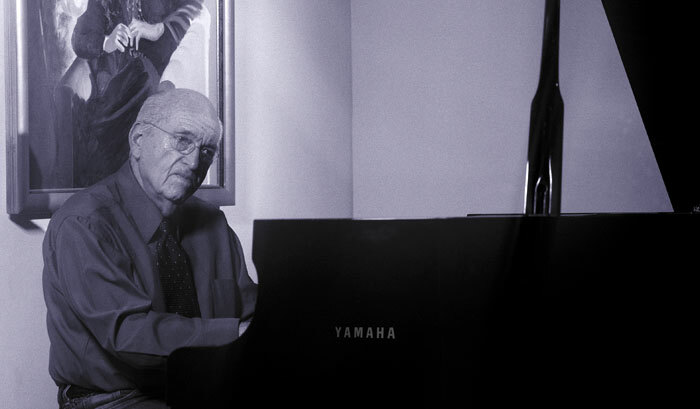 Pianist Ralph Sharon never set out to be an accompanist. When he left his native London for the States in 1953, he was one of England's hottest jazz instrumentalists. But soon after arriving on these shores, he started working with such jazz greats as Johnny Hartman, Chris Conner, Rosemary Clooney, Carmen McRae and, most notably, Tony Bennett, with whom Sharon has collaborated for over four decades. The gentlemanly pianist has no complaints. "I don't find any detriment at all in it," he says. "There's nothing secondary about being an accompanist, and most of the great accompanists are also great soloists." I always try to think of the public and keep the tune in mind. Like Bennett, Sharon has a near-magical knack for balancing stellar musicianship and pop accessibility. "Quite a few jazz performers lose sight of the audience," he observes. "They play very intricate stuff, which can be fun for the musician, but is usually only appreciated by an in-group. But I always try to think of the public and keep the tune in mind." Perhaps that's why Sharon, 77, feels a special affinity for the music of the late jazz pianist Erroll Garner. Garner was a tuneful and understated player who, Sharon argues, never got his critical due. "He was one of our most under-appreciated musicians, perhaps because his style was so very melodic, and because he connected with audiences so well." Sharon proved his own knack for connecting with audiences decades ago when he discovered Bennett's signature song, "I Left My Heart (in San Francisco)." "I got it from some songwriters I knew in New York," the pianist recalls. "I pulled it out of my bag one day in Hot Springs, Arkansas, and suggested to Tony that it might be nice for our upcoming show in San Francisco. A man from our label heard us play it there and persuaded us to record it. We did, thinking we might sell a few records in San Francisco. But it became a worldwide hit." The record's memorable piano counter-melody was inspired by an unlikely source, says Sharon. "It's from an old English song called 'The Wedding of the Painted Doll.' It was just a strange little idea that worked. Now when we play the song, audiences sing that piano line. It was, I think, a pop hook before they even used the word 'hook.'" Sharon still plays 200 nights a year with Bennett and has no plans to slow his pace. The gigs, he says, are as stimulating as ever: "Tony is very inspirational. He's always determined to sing at his best, and he's very creative. He doesn't call himself a jazz singer, but he's very jazz-influenced, especially in the way he responds to the music around him. He sings every song differently every single night. I've played with Tony for over 40 years, yet it's always new." Sharon, too, is open to new ideas. For example, he's a recent convert to Yamaha pianos. "We use them wherever Tony goes," he says. "They're absolutely terrific. The tone is beautiful, just perfect, full of richness and vitality. It's every bit as good as the finest pianos I have ever played. I recently got a Disklavier DC7PRO from Yamaha as well, and I'm in the process of recording a disc for it: Ralph Sharon Plays the Tony Bennett Songbook. I like the fact that I can record it right in my own home. Tony has an arrangement with Yamaha, too. They will be providing instruments for the Frank Sinatra School of Music, which Tony is opening in New York." Many of Sharon's classic recordings are, unfortunately, out of print, but a recent series by the Ralph Sharon Trio is available on the DRG label. Each disc celebrates the music of an American songwriting great such as Harry Warren, Frank Loesser, Harold Arlen, and Sammy Cahn. Sharon laments how the pop media have neglected what he calls "the Great American Songbook". "I blame the record company A&R men and the radio stations. It's a terrible shame, because when I play that music, or when Tony sings it, young people love it. People like Tony Bennett are the keepers of the flame, the ones who are keeping that great tradition alive."